The “give and go” or the “wall pass” is one of the simplest but most effective offensive combination plays in soccer. I prefer to call it the “give and go” because it more accurately describes the action you want to see as opposed to the type of pass (wall). Sometimes players think that the pass is enough and then jog to get the return ball. Emphasize the “go” and they will soon pick it up! 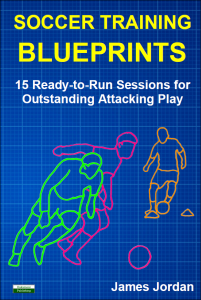 This session is appropriate for any age/level and can be modified as needed. What will players learn from this session? Players work together to beat the defense and accomplish their objective (attacking mindset). Players constantly change pace and direction with the ball in a confined space (mobility). For the second attacker (the player with the ball is always the first attacker) to be effective, she must take up positions to create and maximize the available space (support and width). Successful players, especially the ones who are not the fastest, will start to disguise their movements (improvisation). Successful players keep their head up and eyes open to see where the space is, but also to recognize the visual cues of the defender(s) (e.g., where is she looking, are they favoring one particular side, are they weak on one side, what is their body position?). Praise players who change speed and direction to attempt a give and go. Praise players when they make appropriate decisions about when and where to try a give and go (not the execution/outcome). Praise creativity (even when it doesn’t come off). Praise players when they disguise their intentions. Praise players when they use the give and go as a decoy. Praise players who create space for themselves and/or their teammates with clever runs. Is it easier to beat the defender when you go slow or fast? Why? How can you “draw the defender in”? Show me. When is it not appropriate to do the give and go? Why? Is it easier or harder to beat the defender when you change pace and direction? What else can you do in this game to be successful? Explain that to me. Activity: Two players play against each other and share a ball. They place two cones anywhere from 2-5 yards apart. Players pass back and forth to each other. The rules are that the ball must never stop, must always stay on the ground and must go through the two cones without touching them. Whenever this is violated the other person receives a point. Because of the rule that the ball must never stop, players have to play 1-2 touch. The closer the two cones are the closer the pairs are probably going to be. The farther apart they are, the more they will have to move laterally and look more like the old arcade “pong” game. Play for a specified length of time (e.g., 60 seconds) and see which pair can become the champions. If your players are struggling with this game, make the gates bigger and/or mandate that each player takes two touches (this will slow the game down some, but will reduce the number of mistakes when players attempt to be too aggressive). The objective is simply to get them passing with their partner and working on their first touch. Make a “ladder” and after each game have players move up and down if they win/lose. Impose a maximum touch limitation (e.g., 2 touches, or 1 touch). Change the width of the gates. *The higher the level of your team’s players, the sooner they will figure out how to “game the system” by standing closer to the gate and hitting the ball as hard as they can. If you find this happening, you can make it a cooperative game by having the players count the number of passes they can achieve back and forth through the gate. This happened to me. By modifying the game, we were still able to get lots of passes back and forth through the gate. I also started mandating the number of touches and how far away they were from the gate to vary the game. 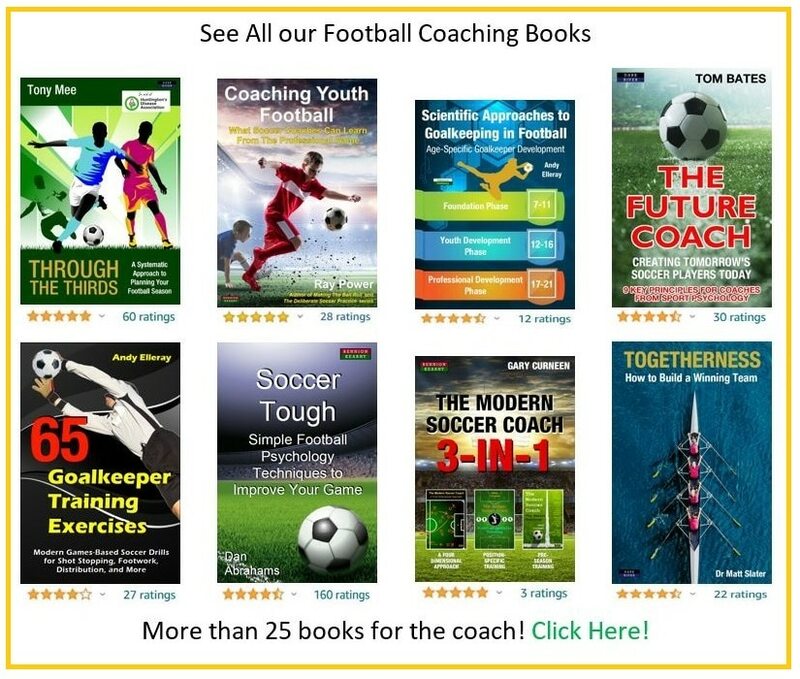 We have more than 25 coaching titles currently available. Area: 25×25 yards (L x W) or larger, depending on how many players you have. Activity: Put players in pairs with a ball. Set up a number of 1.5-yard-wide gates randomly arranged in your grid. The size and number of gates can vary depending on the number of pairs of players you have and their skill level. I would start with at least as many gates as pairs. Players score a point for each completed pass they make through a gate to their partner. Go for 30-45 seconds and have pairs keep count of how many points they get. See how many they get and ask how the top pair got so many. Get them to demonstrate. Repeat. Switch partners. Repeat. If your players are struggling with this game, make the gates bigger. The objective is simply to get them passing with their partner on the move. You should always start an activity so that everyone can quickly find success. Once they understand the game, that’s when you can start to make it progressively more challenging. Add restriction that players must use a certain foot or surface of the foot to make a pass and score a point. Replace some of the gates with pinnies (or different colored gates) and say that pairs must go through a cone gate followed by a pinnie/bib gate. Make the gates smaller/reduce the number of gates. Introduce a bandit (or pair of “bandits”) whose job is to stop pairs from scoring in gates. Change the bandit(s). Area: Square grid of about 12 x 12 yards (W x L). You can make your grid(s) smaller or bigger depending on how many players you have and their ability levels. Activity: This game works best when you have different color cones, but it works just fine if you don’t. Two teams line up diagonally opposite from each other (per the diagram above). One team has the balls. One player passes the ball to the attacker on the other team, then goes to defend him. Upon receiving the ball, the attacker attempts to dribble the ball through one of the offensive gates in front of him. If the defender steals the ball, he can then try to counter attack and dribble through one of his offensive gates. Go for 60-90 seconds (keeping score) and then swap roles. Whichever team scores the most goals, wins. This is a good activity to see how players solve offensive problems in tight spaces. Alternatively, you can have the attacker start with the ball. Depending on the ability levels of your players, you may want to reduce the number of variables (e.g., the defender’s pass to the attacker may disrupt the flow of the activity if he isn’t able to pass the ball accurately and consistently). First time finishes count double (this will encourage combination plays, such as the give and go/wall pass). * This activity could become a staple in your coaching repertoire because it offers the basic principles of attack: penetration, change of speed/direction, width, mobility, and creativity. It also contains the basic principles of defense: pressure, cover, move feet, patience/delay, with emphasis on poke tackles. Activity: Divide the players into 2 even teams. Have one team line up behind the 2 cones level with the edge of the 6-yard box. Have the other team line up in 2 lines on the edge of the opposite box (far cones) facing them. The balls should be divided equally and diagonally (per the diagram). To begin, you can play the ball into the middle. Players go to the other line once they have had their turn (e.g., attacker goes to the other attacker line). Any time the ball crosses a line (side, end, goal), the team whose possession it would be restarts the game from their side with a new pair (the defending pair stays in). Also, any time a ball crosses the end line from a shot (including a goal), the shooter must run around the corner while the 2 defenders drop out (the attacking team now becomes the numbers down defending team), and a new attack begins with 2 forwards to make it 2v1 (with the recovering defender who just shot the ball running around the corner). Play first team to a set number of goals (e.g., 5, 7, 9) and give the losing team a consequence. After the consequence, you can ask the guided discovery questions, while the players catch their breath. This game will take a few rounds for the players to understand. It is very important that you are consistent with the rules. I find it helps to communicate early and often; for example, if the ball goes out of play, I will say “red team’s ball.” Also, if someone forgets to run, I will remind that player (e.g., “Janie, you have to run”). If she influences the play, I will award a penalty kick to the other team, which will transition back into 2v1 continuous immediately following the kick. Time:Approximately 30 minutes (or whatever is left of practice). Area: Using a full field (or as much space as you have available), mark an offside line on each end of the field (per the diagram above). Activity: The only way the attacking team can break the offside line is to play a first time pass into that zone (e.g. a give and go). Defenders are not allowed behind the offside line until the play has been played. This creates an advantage to the attacking team and will result in a lot of breakaways (1v1 to goal). Play even numbers and arrange teams in a formation that reflects your desired game day formation. For example, if you are playing 8v8, you can put teams in a 3-3-1 formation (this gives you central players as well as wide players on both defense and offense). Alternately, you can set up one (or both) of the teams in a 2-3-2 formation to change things up. Allow double the points for goals scored immediately following a give and go. Add a neutral(s) to give the team in possession an advantage. Put one or both teams on touch restrictions (e.g., 3 touch max, 2 touch max, 1 touch max! ).